Somewhere in Saudi Arabia, a young engineer recalls his grandfather sharing stories of when the family earned its living by trading in dates, lived without electricity or air conditioning, and travelled on the back of a camel, rather than behind the wheel of a car. Few could have imagined how dramatically the discovery of oil in 1938 would transform everyday life in Saudi Arabia and its fellow Gulf Cooperation Council (GCC) members: Bahrain, Kuwait, Oman, Qatar, and the United Arab Emirates (UAE). The young engineer’s father enjoyed a solid career in drilling operations, as Saudi Aramco grew into the world’s largest oil producer. The engineer himself went to university in the US, then travelled the world. Now, as he returns home to build his own life, he dreams of a future quite different from anything his father or grandfather had known — a sustainable future, built on great advances in energy efficiency and diverse energy sources. Some might ask why anyone in the GCC needs to dream of a very different future. After all, according the BP Statistical Review of World Energy 2016 , these countries collectively hold 29% of the world’s oil reserves, and 22% of the world’s gas reserves. They also account for 23% of global crude production, and 11% of natural gas. Such abundance would seem to suggest the future is assured. Yet many across the GCC are now concluding that change is urgently needed. To understand why, we need only study a few telling trends. Energy consumption in the GCC countries has grown at an average of 6% per year since 2000, outpacing GDP growth (5%) and population growth (4%). At the same time, the value this is adding to the economy is significantly below developed countries, and is decreasing. These trends are largely due to the development of industries that demand a lot of energy and the relentless rise of energy consumption from the residential market. Low energy prices have provided little incentive for energy efficiency and conservation. This has made per capita energy consumption in the GCC amongst the highest in the world. 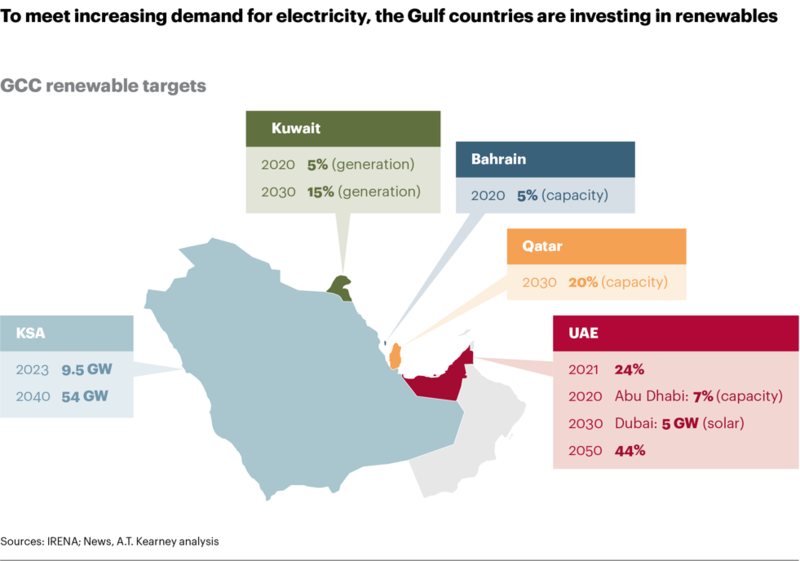 Over the next five years, according to APICORP, the Gulf countries are expected to need to generate 40% more electricity than now, equal to 62GW. Domestic demand for electricity and water desalination is already so high that Saudi Arabia must cover half of it by burning crude, despite being the 8th producer of gas in the world. Similarly, rising demand for domestic electricity has made UAE a net importer of natural gas. In Saudi Arabia, the largest economy in the GCC, overall domestic oil consumption grew from 17% of production in 2000 to 32% in 2015, notes the BP Statistical Review of World Energy 2016. If demand is not curbed or met by alternative energy sources, domestic consumption could absorb most of Saudi hydrocarbon production within the next 10-20 years. This would limit the country’s ability to export crude and fuel further downstream expansion, and those two combined would have significant consequences for the national economy. In short, GCC countries are not on a sustainable path. In the light of growing domestic consumption and the increasing competitiveness of renewable energy, all GCC countries would be wise to accelerate their renewables programmes, while also seeking more involvement from the private sector. 1. Establish bold but achievable energy efficiency and renewable development targets . Utilities also have a crucial role to play in redirecting more investments into renewables programmes, and by transforming their business and operating models to integrate renewables. Will rising generations across the GCC enjoy the unimagined bounties of a sustainable energy future? The GCC has the means. It needs only to muster the will.